Designed by Hang Your Gong in the UK so you can display your medals. UNIQUE double bar per row design so you can hang lots more medals on your medal hanger at the height you choose without having to tie or cut medal ribbons. Easy to fit to the wall, no need for fiddly spaces, as with a breakfront design, the medal hanging bars are offset from the wall. 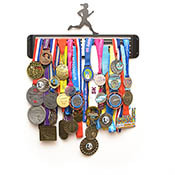 Various medal hanger designs that either have a text based top above the hangers, like the "MY MEDALS" design or a sporting figure, like a runner, as shown above. 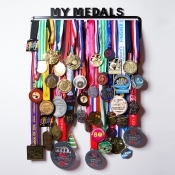 The first design is a large "MY MEDALS" black steel medal hanger suitable for celebrating all medal achievements, be it from a team sport like football or cricket or an individual sport like running or gymnastics, a school or a professional achievement or a mixture of all these. NEW! Standard and large male and female running medal hangers with a running figure above the hangers to celebrate all running medal achievements and standard "MY MEDALS" medal hanger designs also now on sale. Female footballer medal hanger - Coming soon! Male footballer medal hanger - Coming soon! Triathlon medal hanger - Coming soon! "Our Medals" text based top and more running medal hangers! If you would like to pre-order one of the other medal hanger designs or have a design you would like adding please email us. CELEBRATE your achievements – whether they were taking part in 5km or 10km runs, a half-marathon, marathon or ultra marathon, winning a fell race, completing a triathlon, playing in a football team, winning a competition at school, quizzing or awards earned through volunteering or charity work. MOTIVATE yourself to keep your effort up, seeing what you’ve achieved in the past and reminding yourself of what you can do when your put your mind to it, whether it’s in your school-life, your leisure time or in a professional capacity. INSPIRE yourself, and others, who can see the rewards of what taking part has brought to you, along with increased fitness, friendships or learning and improving skills. ACTIVATE yourself into getting out there and doing more! And if you're wondering about our name, "GONG" is British slang for a medal! Roadshow Events at sports competitions and clubs, gyms, schools and local parks. For more details please see our Roadshow page. If you would like us to attend an event you're organising with our medal hangers, please contact us for availability. By calling or visiting our office in Euxton, Chorley, remember to call beforehand to check we aren't out running. We hope you like our medal hangers and enjoy hanging your gongs off one of our designs.